Precision manufactured metal ring joint gaskets predominantly used in highpressure oilfield applications and for processing industry duties. Available to API 6A (oilfield use) and ASME B16.20 (general use) standards to fit ASME, BS and DIN flanges. James Walker Moorflex is licensed by American Petroleum Institute to apply API monogram to gaskets in accordance with API 6A PSL4. • R type (oval and octagonal) solid sections to fit standard ring joint flanges with trapezoidal grooves. • Types RX and BX with complex bevelled edge sections for wellhead pressures above 700bar. Non-standard: high nickel alloys, super alloy steels, and other stainless grades. • PTFE inner rings – for siting in the cavity between flange bore and ring joint to reduce turbulence and flange erosion. • Neoprene sponge flange guard protectors – for fitting externally to ring joint gasket to minimise ingress of moisture and dirt. • Rubber coated ring joint gaskets – soft iron metal ring joint gaskets encapsulated in nitrile rubber for testing wellhead assemblies and valves. 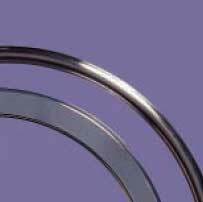 Rings can be reused and do not damage flange grooves. All sizes and materials to the standards listed, and to customer specification.